This started eight months ago, when the hydroelectric power station closed its gates for the first time. Ever since, the road to Kbal Romeas sinks a little deeper under the slow waves every day. "Beware of the branches above your head," the guide says. "The pythons and the cobras have climbed into the trees." According to the level gauge on the road, the water behind the concrete barrage has risen up to 75 meters, higher than the intended 68 meters. Nobody knows why, and the government doesn’t provide any information. Three sturdy men are unloading planks from a canoe. The houses of flood refugees are being dismantled in order to sell the wood. The village is a world away from Phnom Penh. In Cambodia’s capital, saffron-robed monks are tapping on their smartphones and purple Rolls Royces are negotiating hectic traffic. But 450 kilometers to the north, Kbal Romeas is hidden deeply in the jungle. Here no shops, restaurants or traffic lights are to be found. And for a few months now, no roads either. I’m undertaking the journey with Vibol. He is studying in the provincial capital and returns home often. “My parents are having a hard time since our village is flooded. The government wants us to leave, but we will never do that,” he says. The expansive forests of Stung Treng – a province as large as Lebanon with barely 120,000 inhabitants – are the home of the Bunong, the ethnic minority to which Vibol belongs. Their way of life has been in sync with nature for 2,000 years, while they’ve been fiercely resisting modern influences from outside. But the small community now risks being washed away, quite literally. A few kilometers from the village, a gigantic wall towers over the trees. The ‘Lower Sesan II’ (LS2) dam is a powerful symbol for the economic growth of Southeast Asia, but also for man-made disasters. In September the gates were closed, thus creating a lake that soon will expand over 360 square kilometers, the size of Dublin. The livelihood of a unique culture will be wiped out. The ten-year-old son of my guide navigates the canoe that will bring me to Kbal Romeas. Skillfully, he avoids crashing into the trees of the submerged forest. “Beware of the branches above your head,” his father says. “The pythons and the cobras have climbed into the trees.” There’s a shorter way to get to to the village, via dry land, but that’s not an option for a foreign journalist. The army closed off the whole area. No snoopers allowed. I have to take the long detour over water, a surreal two-hour trip through a drowned jungle. “The trees still bear fruit, but soon they will die,” the guide says. There is also less fish and the water has become undrinkable. Since the dam unhinged their lives, the Bunong have to pay for water and fish. But money is an alien concept for animist forest dwellers who are used to living in complete harmony with nature. 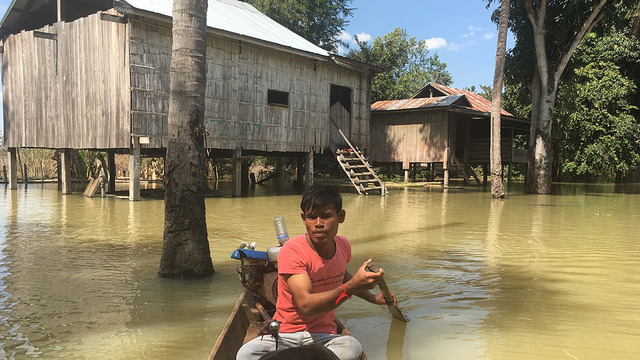 About 250 people still live in the flooded village of Kbal Romeas; about half of the original population. I clamber from the canoe into a house. The lady of the house offers me some rice and spiced pork. “We used to have everything we need here. But since the water started rising, we have to go to the market,” says Srang Lanh, 49. She has the face of someone who has lived a hard life. The government has built a new village, on higher ground. “But we do not intend to move,” says Vibol. “The Buddhist Cambodians don’t understand our religion. We can’t leave our cemetery.” He wants to show me the graveyard. Small corrugated iron roofs are barely above the water. They used to give shade to the late loved ones. Every day another grave disappears into the tidal wave of progress coming from this Chinese dam. “The spirits of our ancestors can’t leave here. To abandon them would be a disgrace,” says Vibol. The Bunong believe they are protected by the ancestors. Leaving means disaster. In Kbal Romeas, the cursed dam is called ‘Kromhun’, the Company. The Chinese group Hydrolancang invested 800 million dollars in the LS2 dam and will be operating it for the next 30 years. Theoretically speaking, a dam producing 400 megawatts might seem a good idea, as this country lives in the dark. Three quarters of the Cambodian villages are not connected to the electrical grid. However, Kbal Romeas will never see one single watt of the Kromhun. Ninety percent of the electricity in Cambodia goes to capital city Phnom Penh and is used for air conditioners, neon publicity signs and garment factories. There’s a little ceremony for the visitor, the first foreigner since the army shut this area down in July. Ta Uot is the most important guardian spirit of Kbal Romeas. His temple is nothing more than a hut on poles, now surrounded by water. But since the patriarch told the Bunong through his visions where his shrine has to be put, it cannot be moved. In the temple are some holy branches and rocks; from their canoes the attendees throw grains of rice towards them while they say prayers in the old Bunong language. They inform Ta Uot about the visit of a foreigner. They also mention the latest water level. A newly born child is being blessed. In spite of the upcoming flood, this is a lively village with a simple shed as a spiritual Noah’s ark. Set Nhal, 89, has been living here his whole life. He remembers the French colonists, the Khmer Rouge and the Vietnamese soldiers who came to chase away the genocidal regime. And now the Chinese. “We were always confident that the French and the communists would leave one day. But the Chinese will never go away; this dam will stay where it is,” he says. Not just a trifle, as 70 million people depend on the Mekong for their daily needs. As we speak, 200 dams are in use, being built or in preparation. LS2-dam is only one of them. For the Bunong, a day in ancient times is as important as yesterday. But their days are numbered. Once the rainy season will start, in June, Kbal Romeas will be history. After dark, a motorbike takes me back to the rest of the world, using a last scrap of dry land. The jungle is black as soot and the bouncing moto passes by a deserted army checkpoint, unmanned at night. I’m dropped off at a gas station, an oasis of neon lights where they promise me there will be a bus soon. I ask Vibol if I can do something for him when I’m back in Phnom Penh.